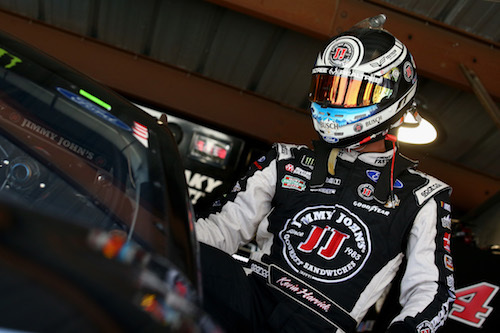 Kevin Harvick announced on his “Happy Hours” SiriusXM NASCAR Radio show on Tuesday night that he would pull double duty when the NASCAR Monster Energy Series travels to the road course of Sonoma (Calif.) in June. In addition to driving his regular ride, the No. 4 Stewart-Haas Racing Ford, in the Cup Series race there on June 25, he’ll also compete in the NASCAR K&N Pro Series West race there the previous day. He’ll drive the No. 4 entry of Jefferson Pitts Racing in the K&N race. Harvick was victorious the last time he competed in the series in 2007 at Iowa Speedway in Newton. It was his sixth-career K&N West victory. Harvick competed full-time in the K&N Pro Series West for one season, 1998, simultaneous to his first full season of competition in the NASCAR Camping World Truck Series. He won five of 14 K&N races that year, including a victory at Sonoma, and claimed the series championship.